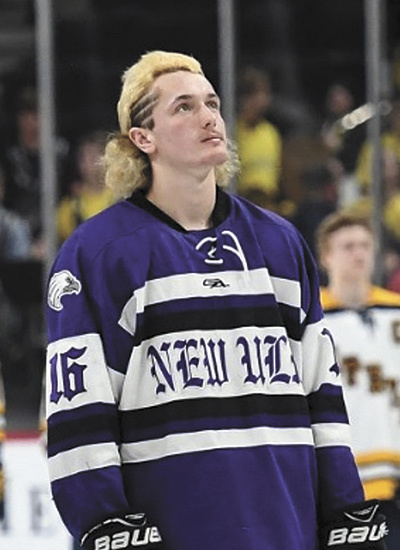 Hunter Hulke is proud to be a hockey player, and even more proud to have made the 2019 Minnesota State High School All Hockey Hair Team. Hulke, who plays left wing on the New Ulm Eagles, was selected as the fourth athlete in GameOn!’s satirical video clip that features hairstyles debuted at the boys hockey tournament March 7-9 at the Excel Energy Center and Mariucci Arena in the Twin Cities. The high school junior grew up on his family’s dairy farm near New Ulm, Minn., where he works for his dad, Nathan Hulke, and uncle, Kevin Hulke. “Big wake in back so you can surf without a rope,” said King in the YouTube bit. For Hulke, his hockey hair has been years in the making. He started skating when he was 3 years old and has almost always sported a mullet. In eighth grade, Hulke added the racing stripes. Once Hulke’s team was destined for the state tournament, he made plans for his eccentric hairstyle. He spent nearly an hour at the hair salon, soaking in two coats of bleach. At the state tournament, Hulke presented his yellow-tinged locks in the quarterfinals’ game against Mahtomedi. Hulke, his teammates and opponents all sported mullets and similar styles. Hulke’s dedication to his looks on the ice comes as no surprise given his work ethic and dependability on his family’s dairy. Every morning, Hulke feeds calves before going in to school to lift weights. On the weekends, when he is not a part of a sports tournament, Hulke helps as much as possible. During the fall, Hulke enjoys combining, hauling and ripping. The high school student believes his upbringing on the farm prepared him for the state hockey tournament and memories that were created. While Hulke hopes to one day follow in his father’s footsteps and be a part of the family dairy, right now he is still celebrating his skating career and famed hockey hair.